I grew up enjoying my mom’s sweet potato casserole for every holiday and it was always a dish I just couldn’t get enough of. There is something magical about comforting and creamy sweet potatoes with an ooey gooey toasted marshmallow topping. When I started eating a vegan diet, I was determined to make a sweet potato casserole that would rock my world just like the one of my youth. Enter: This Ain’t Grandma’s Sweet Potato Casserole. It has been a hit at every holiday dinner I have brought it to. No one can ever believe that it is vegan! Yesterday morning, I was craving this sweet potato casserole in a major way. It was 7:15am. I find myself in these situations quite a lot. I looked at the sweet potato, it looked at me…I looked at it again. And I turned that craving into breakfast. 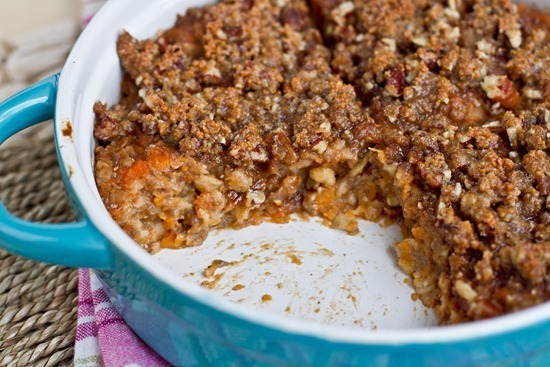 Inspired by This Ain’t Grandma’s Sweet Potato Casserole. 1. Preheat oven to 350F. Bring several cups of water to a boil in a medium sized pot. Add in the peeled and chopped sweet potato. Cook over medium heat, for about 5 minutes, until fork tender. Drain and set aside. 2. 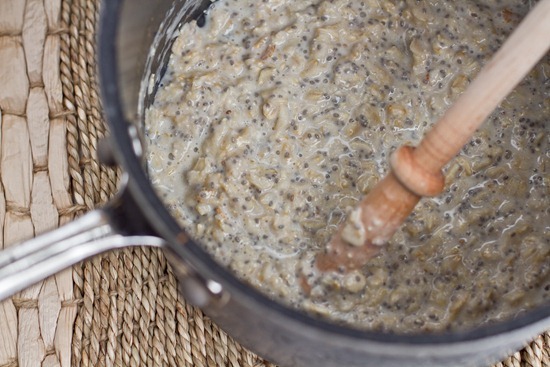 Give the pot a quick rinse and then add in the oats, milk, and chia seeds. Whisk well and bring to a boil. Reduce heat to low-medium and cook for about 5-7 minutes, stirring frequently. 3. With a potato masher, mash in the cooked sweet potato and the banana into the pot. I left some chunks for texture. Now stir in the cinnamon, maple syrup, nutmeg, vanilla, and salt to taste. Adjust seasonings if necessary. Cook on low for another few minutes. 4. 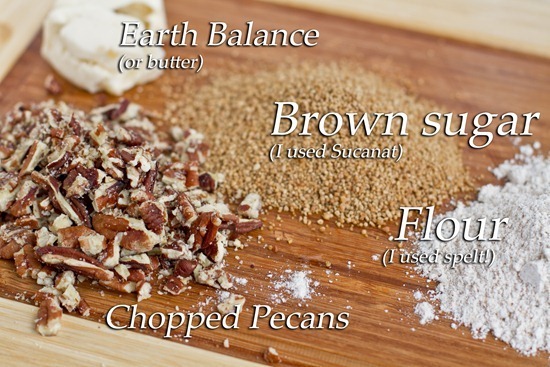 Make the crunchy pecan topping by mixing together the pecans, flour, Earth Balance (or butter), and brown sugar with a fork. until very clumpy. Pour the oatmeal into a baker dish (I used a 4 cup/8 inch casserole dish) and spread out evenly. Now sprinkle on the pecan topping. 5. 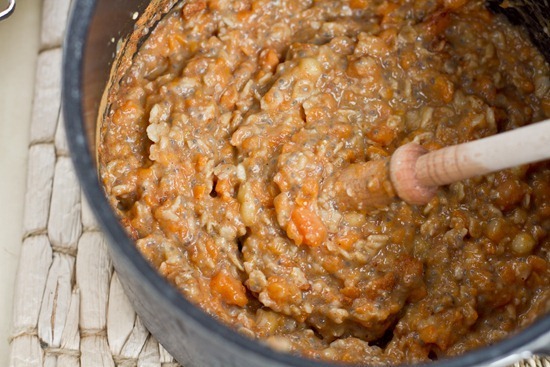 Transfer the oats to a casserole dish (8inch/4cup or whatever you have!) and bake, uncovered, for 20 minutes, at 350F. After 20 minutes, set oven to BROIL and broil on low for a couple minutes, watching very closely so you do not burn the topping. Remove from oven and serve. makes 3-4 servings. Note: You can reheat the oatmeal by mixing in a bit of milk and heating in the microwave. However, it is also very good COLD, straight from the fridge with a splash of milk too! YUM! Nutritonal Info (based on 4 servings with soy milk, without topping): 217kcal, 4 grams fat, 7 grams protein, 6 grams fibre. This is hands down the BEST spin-off oatmeal I have made yet. If you make one thing this week, you gotta make this. The first thing you do is lightly cook the sweet potato for just 5 minutes until just fork tender. It cooks much faster if you cut it into 1 inch pieces. I used 2 cups raw sweet potato, which yields 1.5 cups cooked. For my first attempt, I used Bob’s Red Mill Kasha (roasted buckwheat) and I really did not like the texture, so I started over and used regular oats. I was not a fan of the taste or texture of Kasha in this recipe. I brought the milk, oats, and chia seeds to a boil and then reduced the heat and cooked for about 5-6 minutes. The chia seeds help soak up the milk, so if you are omitting the chia seeds you will likely have to reduce the milk. I used organic soy milk and it was a nice change in this oatmeal. Soy milk also pumps up the protein too. I like So Nice brand because it is organic, using non-GMO soybeans. 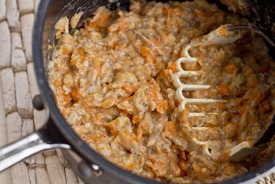 Now add in the cooked sweet potato and the banana and mash your little heart out with your (sa-weet) potato masher. 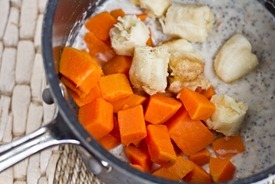 The banana and sweet potato pair wonderfully in this recipe! I left it a bit chunky because I knew my texture monster would be eating it. Season: Add in the cinnamon, nutmeg, maple syrup, and salt. I like to use my Spurtle upside down. It works better that way. Spread into a small 8 inch (4 cup) casserole dish. Any size will do in a pinch though! This baker dish is from Epicure Selections. 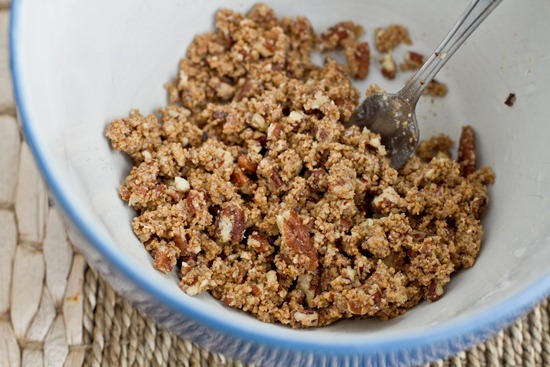 Make the fabulous crunchy pecan topping…this topping brings the recipe to a new level. Mix together with a fork until very clumpy. The topping tastes so good. You may be tempted to dig right in at this point…I say go for it if you want to…but if you bake it in the oven it will taste even better. The topping will get all crispy and buttery and the pecans will toast up into a rich nutty flavour. After baking for 20 minutes at 350F and broiling for 2 minutes on low….golden, crispy magic happens. 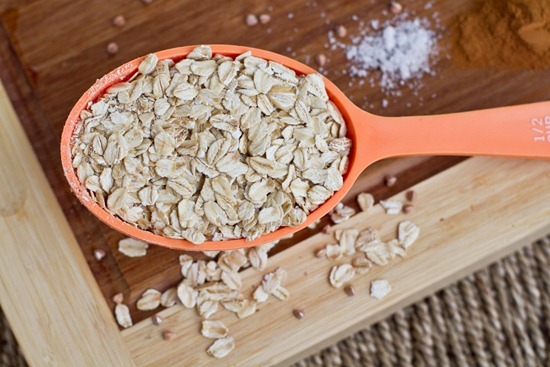 This recipe is hands down the best oatmeal I have made to date…which says a lot because I really love my Carrot Cake Oatmeal, Apple Pie Oatmeal, and Pumpkin Pie VOO. I cut it into 4 servings and proceeded to eat two of them. Naturally. A great thing about this recipe is that you will have leftovers that taste great cold or heated up! It’s a win-win situation here folks. Much like my Carrot Cake Oatmeal, this Sweet Potato Breakfast Casserole tasted amazing straight from the fridge cold with a splash of milk. I better go stock up on more sweet potatoes. Popcorn is truly evil. Rooms look so much cleaner (and bigger) without it. To get the popcorn off you soak the ceiling heavily with water (we use 1/2 gallon water bottle sprayer) and shave it off with a drywall knife. Dump excess into a lined garbage pail lid and then finally into a garbage pail. But first, lay down plastic all over the ground because it makes a HUGE mess. After we did that, we removed all of the wooden frames and then started patching the walls with drywall compound and sanding everything down. This is the worst part by far. Today, I’m renting a steamer from Home Depot, so I can get off this pesky wallpaper. The old water and soap trick didn’t work one bit. Happy 26 days until SPRING! Mmmm this looks lip smackin’ good! I think I’d love it with the splash of milk… maybe coconut milk! YUM! This sounds incredible Angela! I love sweet potatoes any time of day. Do you think I could throw this together the night before and just pop it in the oven in the morning! That’s what my sister & I just did. We will cook it in the morning while we have our coffee. Can’t wait it smells so good! Yep it worked great to prep it the night before. We burned the top of it though. It was fantastic. I am making that casserole this weekend. That looks delicious! Home projects are rough — but think of how beautiful your house will be afterward! Its funny — when you posted pics of your dining room I thought that was the “after” — I liked the wooden frames (but I didn’t realize that is wallpaper!) — but I thought they were painted on the inside. Oops! its kind of an optical illusion…haha! The recipe looks delicious, I just need a trip to the store for sweet potatoes!! …Angela, is there a major difference between the black and lighter chia seeds?? I’m not sure if there is a difference nutritionally, but they both work in recipes as I have used both successfully. Hmmm. That looks delicious. Talk about a great way to get your veggies into your breakfast! Yummy. Can’t wait to see the finish product of your reno-cation. I am extremely excited to make these oats!! Can I leave work now?? 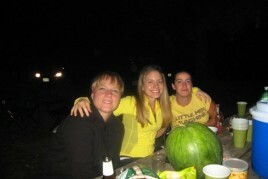 This is really going to hit the spot tomorrow because it’s COLD (in Toronto) today…Boo….but yay for almost SPRING!!! I absolutely love this recipe! I gave my Aunt your This Ain’t Grandma’s Sweet Potato Casserole recipe to bring over for Christmas dinner and it was incredible! She liked the recipe so much, she told me she’s made it 4 times since. I still have a bit in the freezer that I’m slowly enjoying. If this breakfast is inspired by that amazing casserole… it’s got to be FANTASTIC! I can’t wait to try it. The word “casserole” usually strikes fear in me (and my thighs), but this sounds decadent while allowing me to maintain my current pants size. Home run! Haha, I know what you mean bout Reno-week being the end of your marriage. Any sort of project like that (including assembling anything) brings out the crabby in me. 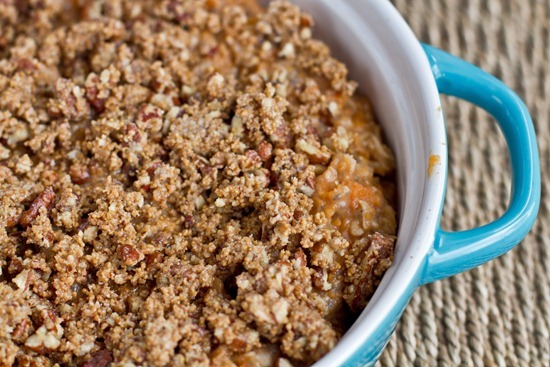 This casserole makes me miss Thanksgiving! I’m glad we’ve got spring and summer before T-Day comes back around. Love that this recipe can double as “cereal” :) I always do that with my granola, too, and it is delicious! i got full just looking at those pictures! i’m thinking about gradually making a switch to vegan, at least 95% to start. i like seeing all your different recipes, it gives me ideas.. vegan ideas! Good luck with that dining room. I shudder to think about removing wallpaper. It’s going to look awesome when it is done though! It’s the topping that really makes these dishes sing! Whether marshmallows or pecans, bring it! I had the best experience with Kasha the other day – I just ate it as a cold cereal with lots of topings and some agave on top. 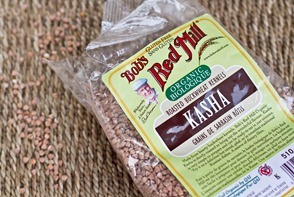 I actually mixed it with some sprouted buckwheat I sprouted myself togther with the kasha it was awesome. I am making that oatmeal tonight! I agree on the popcorn ceiling. Super dated. My BF and I are renovationg our 65yo house and sometimes it’s overwhelming. That tweet made total sense to me :). so that’s how you get popcorn off of the ceiling! my man friend has popcorn walls and it drives me nuts – i sense a renovation project in the future ;) there wasn’t any damage to the drywall underneath? also, sweet potatoes = yum! Oh wow – this looks incredible!!! 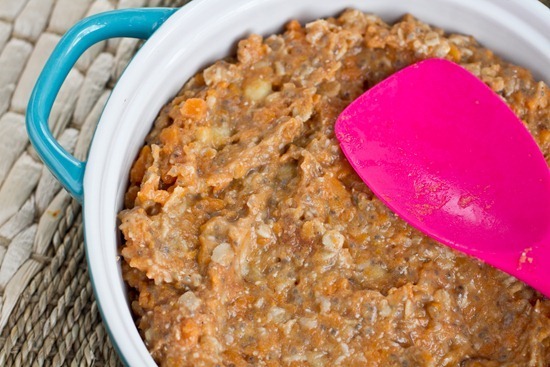 This recipe looks like it’s better suited for oats though and it looks amaaaaazing!! Yaaaay for no more popcorn!! Sounds very yummy and healthy. Sadly I think it’s too carby for me to actually have for breakfast, but I could probably enjoy it some other time of the day. Yum! I love sweet potato casserole so I’m sure this is awesome. 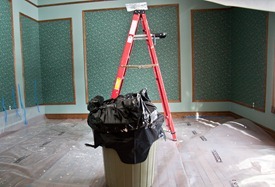 Nice job on your reno, it’s really coming along. This looks just lovely! You amaze me with the recipes you come up with! I look forward to each and every one of them! Looks good!!! I’d love to make that dish. And you are brave with the reno!! This looks so good! I love anything with sweet potatoes. They are my weakness. I am definitely going to test it out! Thanks! Wow, this breakfast looks AHmazing! My mouth is watering. Saving recipe! This looks fabulous! And I have all those ingredients in my kitchen, so I’m totally ready to tackle this one! This looks absolutely amazing and it’s a nice change from regular oatmeal. I love the combo of banana and sweet potato, always great to have a new delicious and healthy breakfast option! 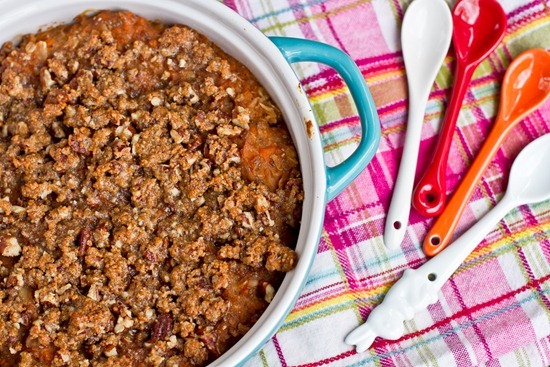 Oh my, oh my—I love sweet potato casserole. My parents moved to Kentucky USA when I was 18 and that was my first ever experience with it – now we have it for every family holiday dinner and it wouldn’t be the same without it!! 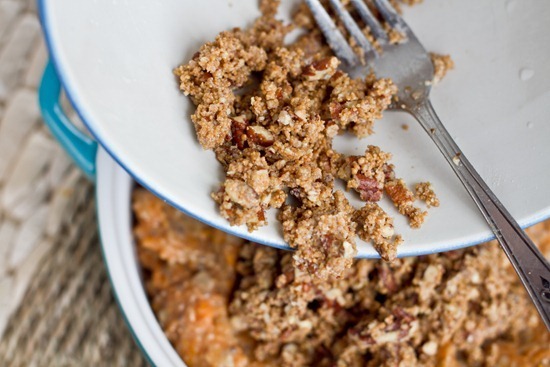 Sweet potato casserole for breakfast – I think it would be great for lunch & dinner as well. I cannot wait to try out this recipe…in fact it might be our dinner tonight. I love baked oats! And sweet potatoes. Looks like the perfect combo! I think I could eat this every single morning. I am on a huge sweet potato kick right now. I love this recipe! 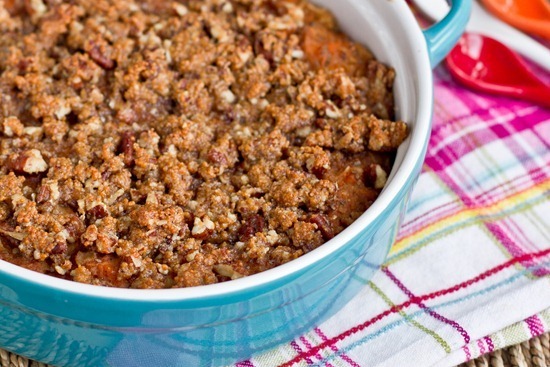 Angela you just won my stomach over…I adore sweet potato casserole!!! I love your blog so much: the occasional self-love topics, the perfect recipes, the stunning photography, and the comedy (your writing is so witty!). It’s interesting about the sweet potato casserole — I alwasy HATED the marshmallow topping. From the time I was a little kid, all I wanted was the sweet potato baked in its jacket with a little salt (maybe butter). The other thanksgiving, we whipped the sweet potato with cayenee and coconut milk. I thought it was still too sweet — but it was great for breakfast the next few mornings. Also, your comment about people not believing something is vegan suddenly struck me as odd. I happen to find eating a vegan meal about once a day to be pretty easy — certainly adding a vegan dish to a meal is easy, and normal. I think back to the hearty black bean soup my mom used to make sprinkled with cilantro and orange wedges, or my dad’s favorite snack of PB on apples. Or my favorite simple tomato sandwich meal in the summer with nothing more than salt, olive oil, and basil. Or my husband’s recent love of spicey homemade hummus, gauc, and salsa. I mean, really — incorporating vegan eating is fairly easy. . . Yes it is, but not many people I have come across realize this. many people I have talked to think vegan = weird or strange. my jaw just literally dropped. this looks amazing! + I have been eating the same breakfast for 23 days now and I didn’t see how anything could change this so THANK YOU haha. gotta get outta my breakfast rut! MMMMMMMMMMMMMMmmm I’m making this for sure!! Maybe even today!! 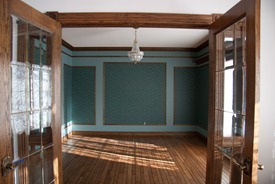 We did some renos too, and it was brutal for us… worth it in the end though!! 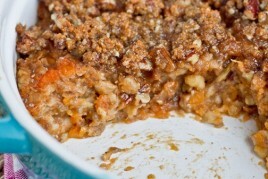 i fell in love with your sweet potato casserole dish.. this looks amazing. once again. haha you are so creative!! i am definitely bookmarking this! I’m making this. Amazing…it looks like a bread pudding, which means it can be my substitute for all the ice cream/chocolate I have been consuming (and my face has been hating…), right? Right…..? the sweet potato goodness looks delish!! might make this weekend! also, for the wallpaper removal, we always use a combo of liquid fabric softener and water and just spray the heck out of it. the fabric softener (like Downy) breaks up the glue and (bonus) smells good! I loathe wallpaper. When I was growing up, my mom was in a major wallpaper phase of her life. She wallpapered every room, numerous times and I was always the lucky one to help scrape it off…on a sweltering summer day of 115+ degrees F…with no air conditioning. Ugh! I’m loving your renovation updates! Oh my goodness, this looks so delicious! Where do you come up with these amazing ideas?! I am making this immediately. I also dislike popcorn on walls, ceilings but I do like the textured/knockdown look for walls, we recently did that on some of the older walls in my duplex renovation, the walls were plaster and a little old and some had cracks so instead of drywalling it all we did that and it really turned out nice! Good luck with the wallpaper, eeek! This looks amazing! I love the combo of the oats, sweet p, and pecans! Can’t wait to try out this recipe! Great job removing the popcorn! It looks fabulous! Good luck w the wallpaper removal! Breakfast never looked so good. YUM! Sweet potatoes for breakfast? Yes, please. I bet this would win the crowd for a weekend brunch type meal. And it’s vegan, too, what a plus! That oatmeal warms me up just looking at it. Just two servings? Shoot, I would have eaten the whole thing. ;-) My mom makes sweet potato casserole with coconut on top. Yum. Good luck with the wallpaper! I have nightmares from a run-in with some wallpaper border. I am makin this for dinner tonight!! I love brinner – although I may have to half the recipe because I would have no self-control when it came to stopping!! My husband is a huge fan of your sweet potato casserole he requests in constantly!! I am also loving casseroles right now. They make the best leftovers ! Oh wow….that would be a GREAT way to start the day. Good luck with the ongoing reno-cation! It’ll be sooo worth it!!! this looks so yummy!! i only have walnuts in the pantry so i may try it with those. love it! I didn’t have the sweet potatoes but I couldn’t contain myself– I had to make it this morning! And it was delicious, thank you! Just thinking about having to deal with that popcorn/stucco makes me cringe. Looks like you are making good progress though!! Yum, this has weekend breakfast or weeknight dinner written all over it! :-) Thanks! I’m always amazed at couples who do home repairs together and make it seem easy, like figure skating. We re-did our kitchen this past summer and my husband dubbed the project “the divorce-maker 3000”. During a daunting, irritating moment he would pepper in random lines like “the divorce maker 3000 is guaranteed to have you lose a finger…” which made those moments less tense and almost hilarious. We recently put-together a seemingly easy baby crib and he said that was the newer model of the divorce-maker 3000 which made us both laugh after 3 hrs of “helping words’ (AKA a lot of cursing). Excited to try this, it looks super tasty! A great idea for something different. I shared it with my facebook fans, thanks! Looking good already! I’m excited to see the transformation! We’ve been in our house for a year and 8 months and haven’t even painted yet…I can’t make paint decisions to save my life! I don’t think my comments are showing up? BUT – God I love all those ingredients! Must make it. Do you try your different trials over a couple of days or did you try the different grains (oats, buckwheat) all in the same morning? Do you feel like your “wasting your time” by starting over?? I’m curious why you omitted the caloric content of the topping? The recipe includes it, yet it’s left out from the total. Even if it’s separate, it would be helpful to have all of the information. Maybe – casserole only = 217kcal; with topping = Xkcal. Cuz, really… who’s not gonna put that yummy topping on? Seems a little deceiving without all the info. Earth Balance is not found in the nutritional program I use, so I was not able to calculate the topping. Nothin’ wrong with having this for bfast! It’s made of wholesome stuff! Wowww you’re killing us Angela~do you think this would taste similar or just as good with yams? We always have yams around in my household. That looks like it taste amazing. I’ll be trying to make it very soon! 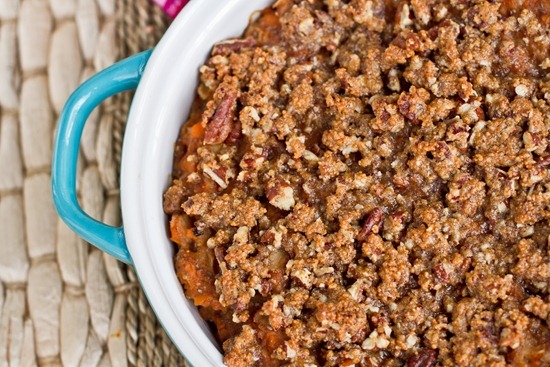 That Sweet Potato Casserole looks delish! And, your ceiling does look so much better sans popcorn effect. That has got to be the most perfect breakfast food. Ever. I’m pretty sure that is the exact same wallpaper that was hanging behind other wallpaper in our master bedroom when we moved in! I am so glad to not be doing renovations. My husband and I are starting to look at houses and that is the part I’m least looking forward to! 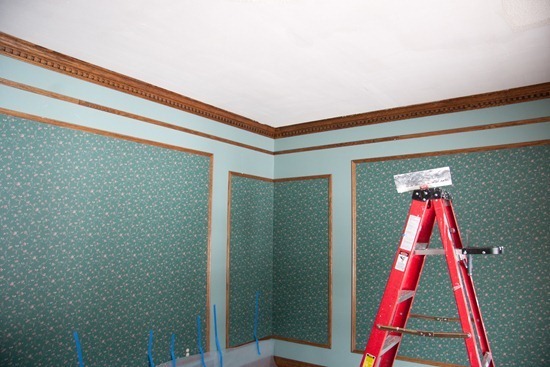 Hello – if you are still working on that wall paper you should try this product called “DIF.” You get a round scoring tool to score the wall paper with little holes and then lather on the dif. wait, and it just peels off without any hard work. i am usually against the use of chemicals in the house but this one really works. and they claim int’s non-toxic?? they have it at home depot. get a gallon jug. good luck!! This casserole..oh it looks amazing. 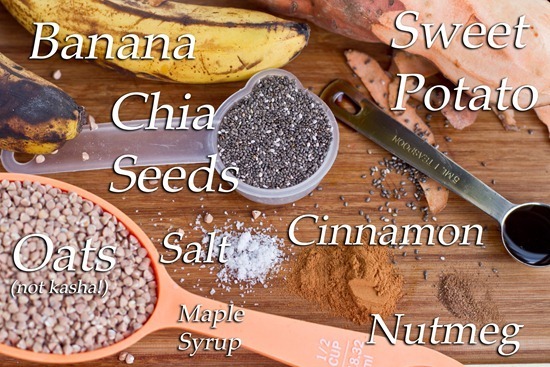 I love the pic of the chia + banana + milk being cooked on the stovetop. Just right there…creamy and wonderful beyond all. Yum! Then add in everything else, the sweet tater and all those wonderful spices…and the crunchy topping! I am such a topping junkie! On streusels or baked crumbles/crisps, I could just eat topping alone. I love them! What a winner of a recipe…and so creative, Angela! oh BOY that looks divine!!!!!!!!!! i hate popcorn ceiling. I lived in a place with popcorn WALLS. the landlady got ma at us because there was so much chipping after only 2 years. it just chips off like crazy. we barely touched it! Ahh, I love all things sweet potato and this looks incredible! Oh, how yummy this casserole looks! What a wonderful dish to make for houseguests, can you imagine waking up to the wonderful, sweet aroma? I have to admit, I really don’t like kasha, let us know if you find a way to use it that has a nice flavor. This looks so amazing. You have a magical ability to combine all of my favorite ingredients in new and exciting ways. what a wonderful idea! And i love your casserole dishes – so adorable! 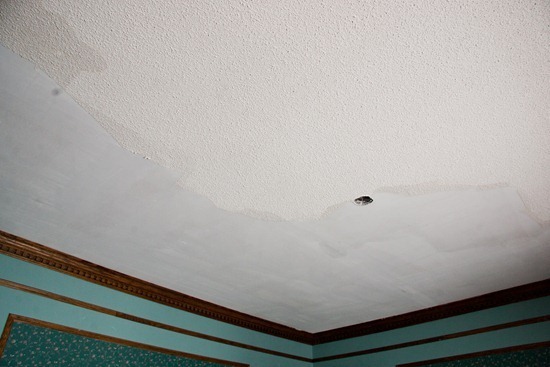 Your renovation project is looking great, but I just wanted to post a word of caution to readers about shaving off popcorn ceilings. We have a popcorn ceiling in our house that we desperately wanted to get rid of. 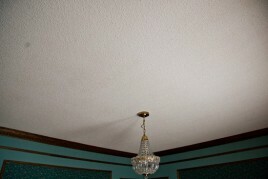 Some popcorn ceilings, unforntunately, have a form of asbestos in them (we got ours tested and sadly ours did!). The ceiling is ok in its present state, but it’s the *dust and residue* that would result from shaving it off that is harmful. I think you win for best breakfast recipes. By a landslide. This recipe sounds fantastic!!! I am planning on making it this weekend! Sounds like the perfect recipe for a cold morning :) Good luck with your renovations! 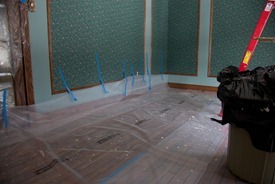 The steamer will work wonders for your wallpaper removal. 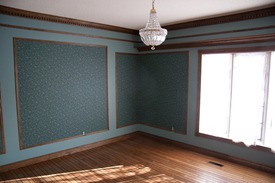 I rented one to take down some wallpaper in our kitchen and it worked the best out of everything we tried. We recently finished our kitchen renovations, the stress and frustration is worth the end results :) Looking forward to seeing your progress! I forgot to mention…one of my patients told me today that this spring is supposed to be a cold one :( :( Let’s hope he is wrong!!! That breakfast looks amazing! And it is nothing that I would have ever have thought of putting together myself! Haha, I know what you mean about the popcorn ceiling, though I’ve never heard it described as that before. Our old house had it :S.
WOW! I have never had anything like this! Being Australia, we don’t even do sweet potato casseroles, so this is beyond my realm of comprehension. It looks insanely good, though! LOVE this recipe, Angela!!! I know what I’m making for breakfast later this week :). My two favorites combined, yum. That is some serious reno business! Oh yum! This looks and sounds so delicious. I’ve NEVER liked popcorn ceilings! What is even the point of them? 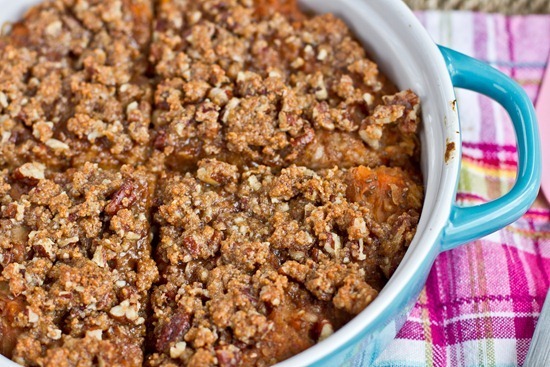 That sweet potato breakfast casserole looks amazing! We had a popcorn ceiling and front wall when we bought our house. Instead of shaving it down, we covered it with more drywall. It worked out perfectly!!! I wish I would have known you were doing that or I would have given you the tip earlier! I remember when my parents were doing some similar renovations in their house … Good luck! 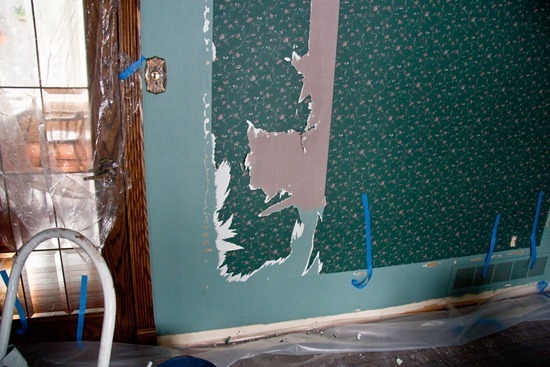 We had a dog who went nuts one day and tore down all the wallpaper in a bathroom, which was a huge help. But we could never figure out how to get her to do it in the other rooms … I don’t envy your job, but I bet it will look so much better when you’re done! Gahhhhh! I’m drooling again. Gee thanks, Angela! Oh my! I am going to have to make that right now. I have all the ingredients at hand and was just wondering what I should do with my sweet potato. Another amazing recipe. I hope you don’t mind if I link to your blog once again to spread the joy! My blog is www.eatdrinkandbeaware.blogspot.com. The steamer does work SO much better. When my mom and I were redoing the kitchen it was a life saving. This is geniussss! I want to make it like, now. That sweet potato casserole looks amazing! I will be trying it out this weekend for brunch – can’t wait! My mom makes the same kind of sweet potato casserole! It is SUCH a comfort good (though really not the healthiest the way she makes it, haha!) Great idea to turn it into a breakfast dish, looks delicious. Sweet potatoes are my favourite vegetable so have made your sweet potato casserole many times, and now you’ve just given me permission to eat it for breakfast without feeling like a nutcase, thank you!!! Angela this looks sooo good! I wonder if I could use carrots instead of sweet potato. I don’t have any sweet potatoes in the house and I’ve kinda used up my budget for the month! Darn! Oh gosh, I must be in heaven!!! Sweet Potatoes for breakfast!!!! OHMYGOSH!!!! sweet potatoes are one of my favorite foods…and I eat one just about everyday, so I am always looking for new ways to enjoy them! this looks absolutely delicious! I actually have never had sweet potato casserole so I’m excited to try this and your actual casserole recipe. This looks amazing and I will defintely make it this week. I do have a question. As a healthy eating newbie, I’ve never had chia seeds before. Do they have a taste? Do they give a dish texture? I’m not a fan of poppy seeds…are chia seeds like that? When dry, chia seeds are slightly crunchy. When wet, chia seeds are slippery and they expand from water absorption. Either way I dont find they have any taste at all. Um, YUM! This is a genius idea! I will be making this stat! Secondly, I love your blog and your recipes, but those are not called regular oats. They are rolled oats. I love this! 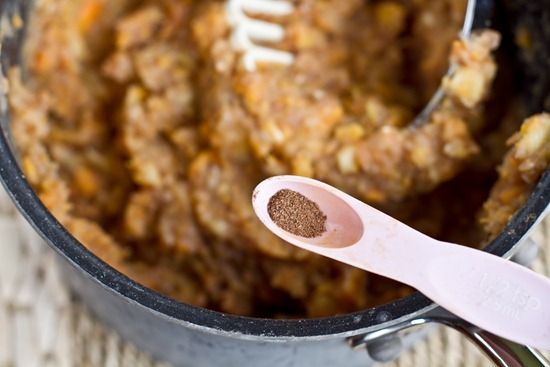 After Thanksgiving, I kept putting a scoop of leftover sweet potato casserole on my oatmeal in the morning and I thought, why haven’t I always been doing this? I never thought to recreate it in February. Thanks for another great recipe. It seems I keep bookmarking every recipe you post. I’m buying avocado today to make that chickpea salad! YUM!! I can’t wait to try this!! I cannot wait to try this! It combines two of the possibly most perfect foods ever created. :D Thanks for sharing! Thanks so much for this recipe, we made it this morning and it is AMAZING! I even brought a little to work for an afternoon snack! I was so excited when I saw this, just had to try it right away. I used ground flax instead of chia seeds in the oatmeal mix. 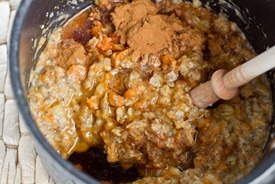 I don’t know why but I doubled the sweet potatoes, milk oatmeal mixture cried out for more. Because I did that the topping wasn’t enough to cover so I doubled that. I did take out the sugar and used chopped dates instead and added oatmeal also. I made this for my sugar free son, can’t wait for him to taste it, I thought it was heaven. I love your ideas even if I have to modify them a bit, a really good base for wholesome but comforting food. I did find the way it was written out a bit confusing but it doesn’t take much when I am not wearing my glasses :) That is why I love all the pictures you include, that really helps me, thanks again. My biggest complaint about my current apartment is the popcorn ceiling and walls! I can’t imagine how the look even came into style. 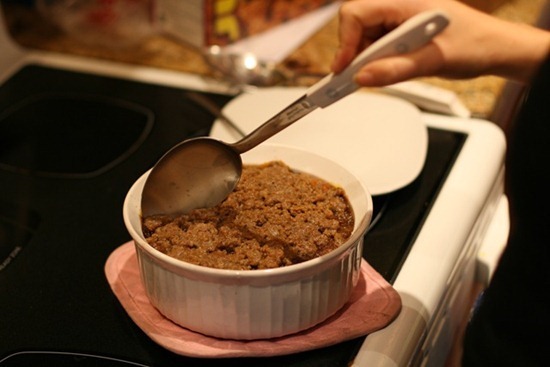 I turned your carrot cake oatmeal into casserole following this recipe as a guideline, and am ravenously devouring [at least] half of it as I type this. I used about 2 medium carrots, shredded, maple syrup, a healthy dose of cinnamon, and a pinch of sea salt. I stirred in some shredded coconut, and used it as a topping with some crushed walnuts as well. 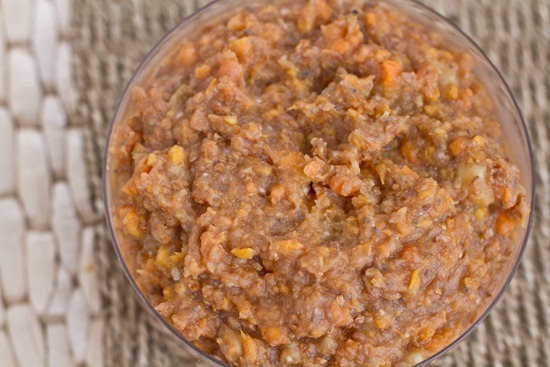 It’s not as thick as the sweet potato casserole, but is sweet and has a great texture. I wanted to let you know I’ve made this amazing breakfast creation twice this week. My husband says he loves it more than the egg sandwich he’s been eating for his daily breakfasts ever since I’ve known him. I’m so grateful. Thank you!! This looks SO good!! 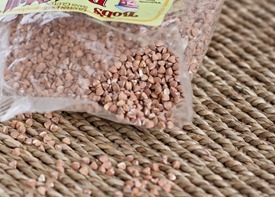 I don’t have any chia seeds so I’m going to roll with it and try soe ground flax. I also don’t have any Earth Balance around…but I’ll see what I can do and hope the best! 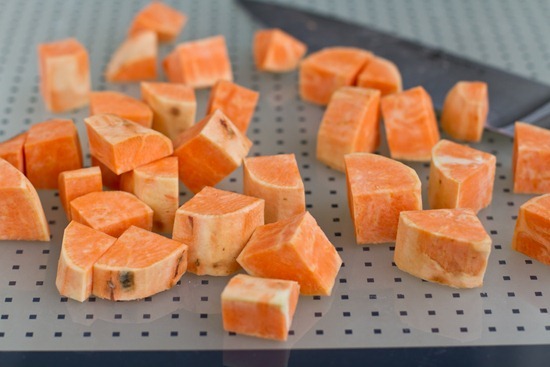 I’m sure I can’t screw it up too badly…anything with sweet potato is delicious! Thanks for the awesome and creative recipe!! im sure it will work with ground flax too…you just might have to reduce the liquid amount slightly. Enjoy!! This was amazing!! Thanks so much!! I cannot wait to try this casserole! 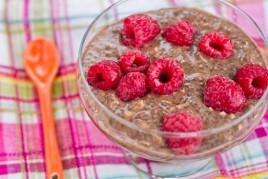 I think when I have this for breakfast I’ll achieve your glow! I made this yesterday morning, and i agree – it is your best oatmeal creation yet. I had it this morning warmed up with some soy milk – worked perfect. The banana is KEY to making this taste good. YUM Banana! If I were to omit the chia seeds, how much should I reduce the milk? Also, I know that the chia seeds are “good for you,” but can you tell me the nutritional benefits of it? I made your rustic chocolate chip banana oat cake with the peanut butter glaze – my girlfriends and I LOVED IT! Have you ever considered writing a recipe book? I have to make this recipe as well! I am trying to bake things that have a high iron count – this looks amazing though. Angela, I’ve been following your blog for weeks now and you completely inspired me to finally start my own! I’m not vegan, but I am Paleo. Which means I don’t eat any dairy, grains or sugar, but I do eat meat, fish, vegetables, nuts and fruits. Our lifestyles (food-wise) are so different, but I have been learning to cook and even re-creating some of your recipes to fit my own! 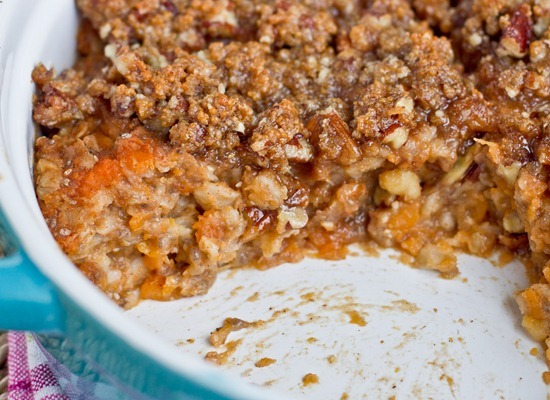 It’s been fun and I just made Sweet Potato Casserole for breakfast, minus flour, oats, sugar, earth balance…. It’s actually in the oven as I write :) THank you for all your awesome recipes and stories. Just made for me and my husband, Eric, this morning. I was a little wary b/c I don’t usually like sweet stuff with my oatmeal. In addition, Eric is kind of picky. However, we both loved this. Eric has declared it ‘a keeper!’. Tastes so good it’s hard to believe it’s good for you. Thanks for the recipe. Looking forward to trying some more! This looks great, and your blog has so many great breakfast recipes! 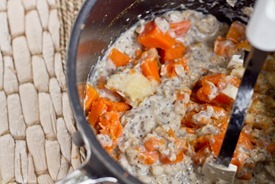 I’m so glad to have stumbled across it and will definetly be making this one and the carrot cake oatmeal! this looks delicious! where did you get those awesome blue and red dishes? This was delicious! I did almonds instead of pecans, coconut flavoring, and unsweetened almond milk just because I had that on hand instead. I reduced the topping down about a half. It was still great! Keep’em comin! Boyfriend who claims he doesn’t like oatmeal just said “This tastes like pumpkin pie.” Thanks! Oh, also, I did walnuts instead of pecans and they worked really well! I also skipped the chia seeds and cut the milk back to 1.5 cups. I have made this a few times– usually gluten free and dairy free and it has gotten such rave reviews that a friend asked me to make enough for 30 for their post wedding brunch– YIkes! But it was a HUGE hit at least 6 people asked for the recipe. It is now my go to for breakfast gatherings and i have yet to meet a single person who doesn’t love it. Wow that’s awesome!! :) Thanks for letting me know. I noticed the vanilla extract in the ingredients list, but it wasn’t listed in the directions. In what step should it be added? Sorry about that Carol! I added it to step 3. Enjoy! OMG! This looks awesome! I just love oats. I have bookmarked this and am making it soon! I want to make this but have a child who is allergic to banana. Can I just add more sweet potato and if so…how much? Im sure you would add a bit more (maybe 1/2 sweet potato?) but you’d need to add more sweetener to make up for the banana. You could also swap the banana for dates. Funny that you found yourself wanting it for breakfast (since it’s a holiday side dish) and I sought this recipe out for breakfast fare. I do sweet/savory casseroles all the time for breakfast. Pancakes are only served for dessert in Europe and I make a breakfast lasagna. Go figure. It looks devine. Can’t wait to make. –Thanks. I enjoyed this for breakfast with my family the last day I was home for the holidays. Thank you so much for a wonderful, healthful recipe that I could share with my loved ones! As hard as it is to do I’ll save this for next week as I am making your mini peanut butter cups this weekend! One sweet thing at a time you know. They’ll both be for breakfast so I don’t want to have to decide between them. Hi Angela. This is Marilyn, I live in Anchorage, Alaska and own and operate a very nice bed and breakfast here. Your website has been a great asset to me in cooking for vegan and vegetarian guests. I’d like to thank you for that. I did not know what a chia seed was before I read your blog. : ) I’ve made this oatmeal several times for guests, and now have been been making it for me and my family, as I love it so. Talk about the ultimate comfort food. So… thanks! I’m getting ready to make it for tomorrow’s guests and thought I’d write and tell you how much I appreciate you. Could I use coconut butter instead of E.B in the topping?? Wow this was awesome, was looking for something Vegan for a mother’s day brunch and was a big hit!!! Will save this recipe for future use!!! BIRTHDAY CASSEROLE!!! Thanks So Very Much For Thus Recipe. i Had a SAweet potato From a New Urban Farm In Raleigh, nc. It Is my Girlfriend’s Birthday Today So i Raced downstairs With Our New Chaweenie. ( I Am Having alot Of Fun) Anyway, i Had Get It All Together Before She Came Down. She Is The Love Of My Life And i Made Her Feel So Good With This dish. Thanks Again. p.s. I Made My Own Version Of Your Green Goddess Dressing Adding Tomatillos. Oh My Goodness. I am a brand new fan; this is the first recipe of yours that I’ve made and I will now be a follower for life. This stuff is freakin’ amazing! I literally ate it for breakfast and for lunch and I’m eating an apple right now – even though I would rather be eating that oatmeal – only because I figure I should *maybe* eat something other than the oatmeal today. You are so right about the topping – SO delicious! I am going to tell all of my family and friends about this recipe! FIVE stars – you rock! There’s only one thing…you mentioned that there will be leftovers. Negative. Not with me in the house! :) Thank you so much for sharing! Hey Casey! So glad you enjoyed this recipe so much! :) Thank you for letting me know…it makes my day to hear this kind of feedback. Wishing you many more yummy recipes to come! Hi, I just wanted to let you know that I LOVE this recipe. I feel that many, many sweet potato recipes are just oozing with unhealthiness, but this is so wonderful that I have made it four times already on Sunday nights, and I eat it for breakfast 3-4 times the following week to aid in getting to work on time. Last night though, I forgot to cook the oats before stirring into the potato mash and figured that to be safe, I should bake it for 30-35 minutes, and everything came out perfectly. So if you want to skip a step, you can skip that one! I also had some left over peeled apples from an apple pie and stirred in about one very small apple, and it added some nice flavor. Thanks for making my life easier by sharing this healthy, vegan recipe! Another recipe to my ” I Love this!! ” list!!! I did this today, and oh my god!! I am desperate to check out how it tastes tomorrow, cold, right out of the fridge!! Yummy! I made this without the seeds or salt and reduced the milk to 1-3/4 cups. It turned out great! We both loved it. Definitely one of my favorite recipes I have made from your site. I just wanted to drop by to say that I’ve made your recipe half a dozen times already because it’s a refreshing change from standard breakfast fair and is great made the night before. I use Earth Balance coconut spread for the topping and sometimes throw some shredded coconut into the mix. Once I forgot the sweetener and hardly even noticed. Thank you for this breakfast! I loved this! Like you were saying, it’s fairly similar to the sweet potato/yam dish I grew up with that I would only have at Thanksgiving and Christmas. It’s a good thing I only had it then, because it was laden with butter and brown sugar! I love having this for breakfast and knowing that it’s healthy! I might try next time subbing the Earth Balance for coconut oil. My topping was a bit mushier than I would like and I think the oil might make it more crumbly. Also, I made this for a cooking class yesterday as a demonstration vegan breakfast food and people raved about it and loved it! So thanks! This was delicious and very satisfying. I used almond milk because I had just made some. Everything else per your recipe and it was wonderful with a cup of tea. It is a meal, a snack and desert all in one!! Super delicious! I used quick oats instead of rolled oats, and mashed everything really well, to get a smoother texture. I have been making this for a while now and I used to follow your recipe exactly. I’ve started adding the zest of one orange to the oatmeal/sweet potato mixture, along with 1/4 tsp Chinese five spice, and two or three tablespoons of coconut to the topping and I love the new depth of flavor that it adds. Sometimes I use half coconut milk and half soy along with a tbs of protein powder for an more coconutty flavor. Thanks for this! I am so excited. Yesterday I made a vegan sweet potato smoothie and stupidly added flax. The gritty taste is aweful. So I incorporated it into this bake. In the oven now! Woohoo! Just made this last night and it is heavenly delicious!!!! I can eat this all day long! YUM!!! However I’m not big fan of oatmeal. Do you think I can replace it (rolled oats) by millet? Thanks a lot for wonderful recipe! I made this last night, and ate for breakfast this morning. It was delicious and I have no complaints. Usually I prefer my breakfast fruity, but I didn’t miss it in this casserole. The only thing I did differently was use walnuts in place of pecans. Next time I might add dates or raisins. Yum! Another hit and easy to make. I love making a warm breakfast on the weekend and the whole house smells great. I used walnuts instead of pecans, still delish! I made this this morning, and it’s seriously THE BEST THING I’VE EVER EATEN IN MY WHOLE LIFE. Sorry for the strong statement, but it’s true. Thanks Angela for the amazing recipe! You are truly an angel (like your name). Everything went so well together, and I can still taste the buttery flavor of the pecans in my mouth now. And it’s super healthy!!! I can see myself making this very often in the future. So I’m prepping freezer meals (due with my 5th kiddo soon), and I am wondering your oppinion on freezing this. I tried to read through some comments, but didn’t see anything. My question… should I bake it before freezing, or just layer it in the casserole dish, freeze, and then bake it once it is thawed? What do you think?! Being productive and prepping for the week ahead (naturally pulling some recipes from your site), I just made this for tomorrow’s breakfast. It smelled AWW-MAZING! I pulled it out and there was just no way I couldn’t have some right away. I’m debating the merits about eating it all at once as I write this…oh boy…..heaven on a autumn Sunday evening. Honestly, I really can’t thank you enough for all of your recipes. As gluten free and vegan for almost a year now, it certainly has it’s challenges (the rest of my family eats “normally.”) With recipes like this I find it hard to see what I am missing!!! Oh Angela i’m OBSESSED with your reciepes! I am going to make all my Christmas meals with yours’ :D. I wanted to make this one for my family’s Christmas breakfast but i wanted to know if I could do it with apples, since not all of them are as much of a fan of sweet potatoes? And if yes, could I prep it the night before? Thanks! Made this for breakfast this morning (minus the crumble topping) and it was absolutely delicious. Topped it with some crushed walnuts, and packed up the rest for the next few days breakfasts. I made this as one of two main dishes for a baby shower brunch (the other was shrimp and grits) and it was a HUGE hit! There were 20 guests, and I doubled the recipe – there was not one morsel left. What would you recommend if I need to omit the pecans because of a nut allergy? yum!! this looks delicious.. I think I will make it for a brunch I am arranging. Any suggestions of what it would pair well with? Wow! Needed a change for breakfast and this hit the spot…made it with the help of my two kids-they loved it! Gobbled it between the 3 of us and will make it again when hubby is here to enjoy. Didn’t have sweet potatoes on hand but used butternut squash. I stumbled across this recipe right after Thanksgiving, when I was looking for something to do with my leftover sweet potatoes. I have made it two more times since then because it is soooo good! The last two times I made a double batch on a Sunday so we could have it for breakfast throughout the week. Just finished scrolling through your other oatmeal recipes, looks like we are going to have to give bananas foster a try. Thanks! Hey Mary, Oh I’m so happy you tried this one out! I actually had forgotten about it so I’m glad you reminded me of it. I will make it soon. My kiddos love sweet potatoes! All the best to you in 2018. I made this exactly as outlined, except I replaced the pecans with sunflower seeds and pumpkin seeds. I couldn’t believe how amazing the taste and texture turned out it! The only thing I plan to change in the future is to decrease the sweetener a tat. Eg in my next test run, I’ll use coconut sugar instead if brown sugar in the topping. By the way, I baked it in a glass pie pan, which provided an inviting presentation. Hi Laurie, It’s been a while since I made this and now I’m drooling at the thought of it after reading your review! Thanks so muc for trying it out and sharing your thoughts! I think it would be such a nice brunch addition too. 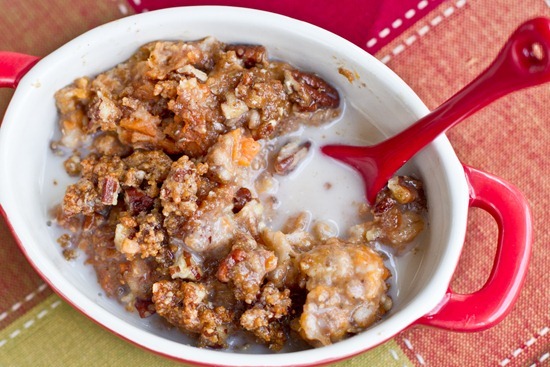 Have you tried my baked carrot cake oatmeal yet? That one is one of my faves.